Core Design is one of the main companies that come to mind whenever I think about or converse about the Sega CD, as it seemed to be one of the biggest supporters of Sega’s ill-fated add-on. I actually grew to have an appreciation for the company’s releases, enjoying AH3 Thunderstrike, Soul Star, Jaguar XJ220, and to a lesser extent even the Chuck Rock series. I finally got a chance to play through Wonder Dog, one of its earliest efforts for the console, but I ended up being let down this time. Let’s take a look at Core Design’s mediocre and humble beginning on the Sega CD. Wonder Dog starts off with a rather low quality FMV intro telling you about the game’s underwhelming story. An evil race called the Pitbully Space Armada is trying to conquer a race of K-9s on a several planets in a solar system distant to ours. Just as the planet is about to be taken over a scientist named Dogtor Kibble is perfecting a serum to make a Wonder Dog (basically this game’s version of Superman) but has no one to test it on. In a last-ditch effort, he decides to inject the serum into his infant son knowing that it may be the end of him. After he gives him the serum he then sends him off in a small space ship to Earth in hopes that he will realize his powers and be able to save his race from oppression. Once he arrives on Earth, he’s found by a young boy who tries to take him home but is refused by his father. As he sulks away the pup starts to come into his abilities and starts to realize that he is meant to save his race and he sets off. The FMV intro will be a glimpse of things to come as far as what to expect of this game’s quality. It’s a really shallow story done a million times before, and the video is really lame. Half of the opening video is simply a still screen with a planet rotating around in orbit while you listen to the voices of the characters tell the story. The rest of the game, while not bad, follows the same generic and rushed path that the intro took. I want to take part of this review to focus on how many different Mario games this “me too” of a game rips off. 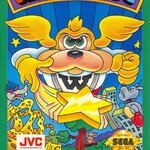 Wonder Dog runs and jumps just like Mario does in his games. He attacks by throwing stars which bounce around the screen just like Mario’s fireballs do in Super Mario Land. Each of the worlds have a special icon to find and once you do it throws blocks in all directions which make invisible blocks and platforms appear allowing Wonder Dog access to hard to reach areas just like the switch palaces do in Super Mario World. A majority of the stages are large, open ended, and sprawling just like the levels many of the Mario games. Core Design also made all of the bosses almost identical in their patterns and all can be defeated easily once you learn the pattern of the first few you fight. The bosses in this game seem to be analogues of the bosses in the Chuck Rock series, which included many ideas seemingly borrowed heavily from this game. Are you starting to notice Core’s pattern of non-stop idea recycling yet? Once you get started with this game you need to go into the options menu and change the control settings to something manageable as the default settings make the game pretty hard to play. The game is more or less a Super Mario clone with the same mechanics, but by default it has jump set to C, run to B, and attack set to A. Since you need to be able to fire quickly, often times in mid jump the default setting doesn’t give you enough reaction time to fire quick enough. Once I set run and attack to the B button (ala Super Mario Bros.) it made the game play much more manageable. The gameplay starts out rather awkward until you get used to the slippery controls. Wonder Dog’s attack takes time to master since the stars bounce all over the screen, and it makes lining up shots with enemies tricky at first. He also slides around a bit and won’t stop on a dime which also takes some getting used to. I made it through a few stages the first time I played it and had a game over and turned the game off in disgust. I decided to play it again a day or so later and got used to the controls, and the game was a breeze to play. Quite honestly, it was too easy, and all of the levels, though different looking, felt almost all the same in regard to gameplay. The bosses almost all share the same pattern as I stated earlier and range in difficulty from really easy to pathetically easy. It also almost seems like they created the bosses in this game first and then created Wonder Dog’s attack specifically for them since you’d have a hard time hitting the bosses if his stars didn’t bounce around the screen. It then feels like the stages were created last since his attack works so awkwardly for them. The graphics are only decent for this game. They are bright, cheery, and quite colorful but do little to take advantage of the added hardware the Sega CD offers. I didn’t notice any additional scaling or parallax whatsoever, just a very quickly put together visual scheme that’s serviceable and nothing more. I did like the warped and bent visuals in the city themed stage two and the bizarre and strange visuals of Planet Weird, stage five, but the rest of the game got repetitive aside from that. Wonder Dog and the enemies aren’t painful to look at but only look adequate and could really use some visual pizzazz. If there was one thing that Core did well here it would have to be the music. It’s probably the only thing that made decent use of the Sega CD’s capabilities (FMV not included, as I’ll touch on that more soon). The game starts off with an epic sounding super hero-themed intro at the title screen, and I liked that. Each of the worlds has its own tune, and each one is very bubbly sounding and feels like it’s been ripped from a Saturday morning kid’s cartoon. They’re pretty nice to listen to and fairly catchy. I played the disc on my PC through iTunes, but unfortunately the music was just a bit too loopy and bubbly to listen to by itself. Accompanying the gameplay, however, it works perfectly. The sound effects are also decent but still only feel adequate and are ultimately unmemorable. My biggest complaint with this game is with the last several FMV sequences including the ending. It could possibly be my copy of the game, but I’ve played the game a few times through and the last several scenes didn’t have any audio at all which is really cheap and lazy on Core’s behalf, as if the programmers just wanted to get the game done and never had it fully play tested. I can’t find much info on this online since the game doesn’t get much attention, but if yours has audio in the end sequences then let me know. The bottom line for Wonder Dog is that it’s just an average game that’s too easy, lacks variety, has a poor story, and doesn’t make any decent use of the CD’s added capabilities. Ultimately, it just feels like a cash-in for the system. If you are a Sega collector, then you may be interested in knowing that there are two different boxes for this game; the common green one and a much rarer red box with an entirely different picture on the front. It is still unclear as to why both exist in the first place, but if you’re not a collector than this game will probably hold little value or interest to you because though it’s not a bad game by any means; it’s just too easy and only worth maybe a single playthrough. It’s not worth tracking down since there are so many platform games that are better than this on the Sega CD. a decent, average platformer for the Sega CD. i enjoyed playing it and also liked the intro, as childish as it may be in that saturday morning cartoon way as mentioned before. the word average is perfect when rating this game, it’s fun but nothing groundbreaking here. if you can find it cheap go ahead and grab it, beats playing a crappy FMV game anyway. i’d even give it a 6/10 but this review is very good.